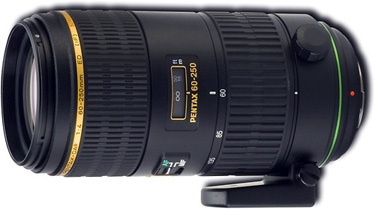 The Pentax DA* 60-250mm f/4 ED (IF) SDM Autofocus Lens is a must have if you are shooting Pentax and interested in sports, action and wildlife photography. This lens was built to endure harsh conditions with excellent dust and weather sealing. Because of the high tech 15-element optics used on this lens you can expect your subjects edge to be sharp. The quick shift system allows you to quickly switch from autofocus to manual mode in a flip. The auto focus is built in and quick. This is the best Pentax has in the telephoto zoom range. Front cap, hood, 67mm filter and rear cap.